When Ebola hit Freetown in September 2014, our team in Sierra Leone responded quickly. 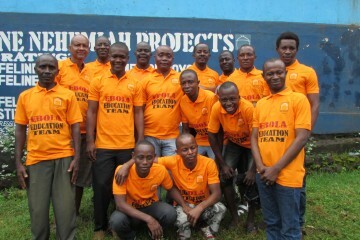 By mobilising the local community, Lifeline Nehemiah Projects recruited a team of volunteers to deliver an Ebola Education programme they designed with local people in mind. Targeting churches and community groups in Eastern Freetown, they delivered engaging training on the spread of the disease, how to prevent it, how to identify the symptoms and where to seek treatment. Video clips are screened, followed by explanations and a Q&A session, which ensures that everyone’s questions and answered and people feel confident in protecting themselves and their families. In order to reach a wider audience, the team also used local radio to deliver the teaching sessions, using a role-play scenario involving a skeptic, a religious leader and a health expert, followed by Q&A sessions. The training has been well received by communities throughout Freetown, with demand for the team to visit more communities increasing daily. The team of 47 have reached over 50,400 people through more than 100 different community groups, a number that increases each week. The programme has been particularly effective in dispelling popular myths surrounding the Ebola virus, and encouraging local communities to engage in reducing its transmission.